Can you believe it? It’s another Monday already. And you all know that when it is another Monday that means it is time for another Technostamper Monday Lunchtime Sketch Challenge! I just love those sketches where as soon as you see it, it sort of just designs itself in your mind. Yep…this was one of those. What I like about this card is that overall it is a pretty simple card (and nice and flat for mailing!) Yet it’s all sparkly and shiny for the Christmas season! 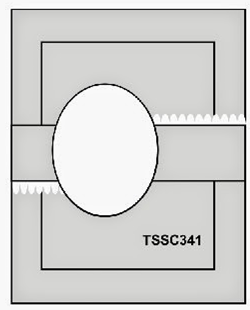 Very Vanilla – 3 x 4 1/4. 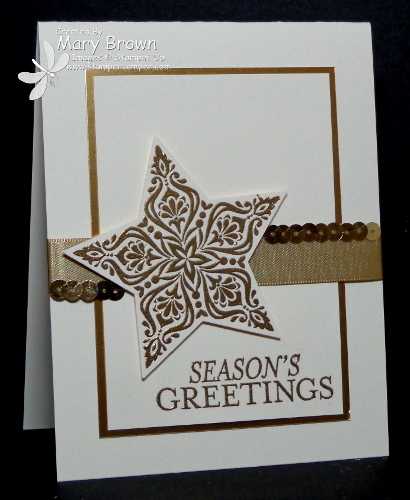 Stamp greeting using Versamark and gold emboss. Layer onto Gold Foil – 3 1/8 x 4 3/8. NOTE: I cut out a 1/2″ frame all around. It saves the paper and makes it easier to attach the Very Vanilla panel. Stamp Star (smaller one) using Versamark on Very Vanilla and cut out using Star Framelit. Add to card front using dimensionals to finish it off. I hope that when you see this sketch you will be inspired to join us! Don’t forget to check out the other members of the team and remember go to the Technostamper blog to play along! This entry was posted in Holiday Mini, Technostamper Challenge and tagged Bright & Beautiful. Bookmark the permalink. What a festive card, love the gold sequins. Perfect touch. Awesome job as always! Thanks so much for always having such wonderful cards each and every week for my sketches!